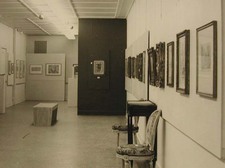 In the fall of 1960, the University Gallery showed 40 master prints by the famed Norwegian artist Edvard Munch. 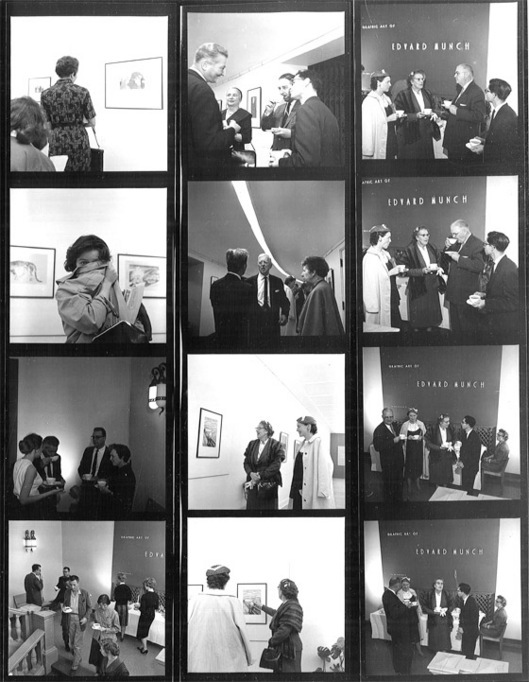 These contact sheets feature images from the opening. 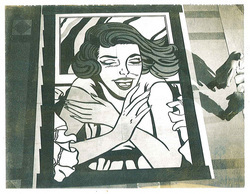 Everyone seems to be drinking coffee or tea from tea cups, a tradition I’d rather like to see revived at art openings. 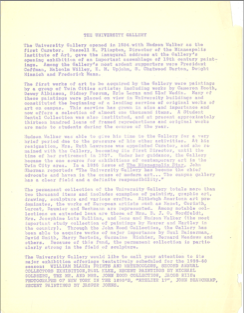 Found amongst the files was a draft of a brief history of the University Gallery. 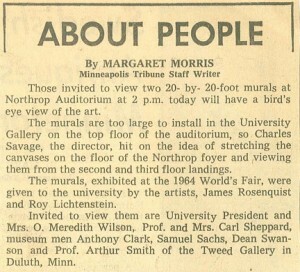 No author is identified, and while the tattered edges and coloring of the paper can give clue to its age, the final paragraph draws attention to the tentative list of exhibitions scheduled for the 1959-1960 season, providing an indication of when the draft may have been created. 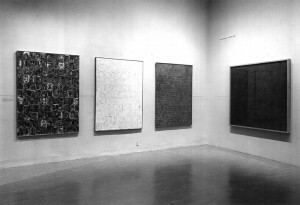 The draft identifies the major contributors to the development of the Gallery, to include President Lotus Coffman, Hudson Walker, and Ruth Lawrence. 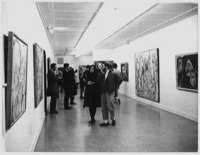 A description of the scope and size of the permanent collection and mention of key works is included. 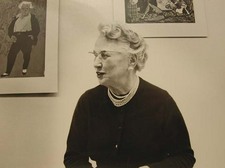 Following Ruth Lawrence’s retirement in 1957, Sidney Simon, assistant professor of art, was hired as the next director of the University Art Gallery. 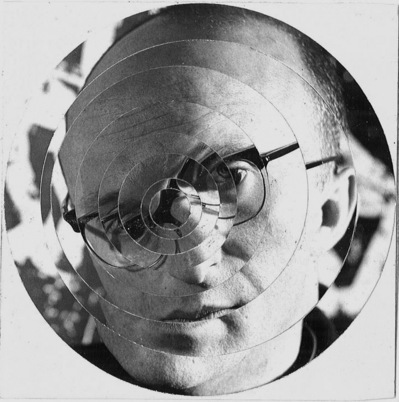 Inspired by the photographs found of the 1947 exhibit, “Materials and Tools of Art” I thought it would be of interest to share the Materials and Tools of Archives – as related to the WAM Files project. First, the location. 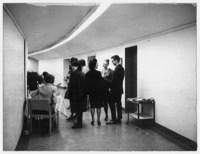 Processing occurs in a secure subbasement workroom of Elmer L. Andersen Library on the West Bank campus at the University. The workroom is shared by the many archives and special collections units that comprise the library. 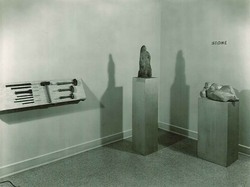 In a front corner of the room, the “materials and tools” are kept amongst three large tables which combine to form a U-shaped work station. Let’s start with a few vocabulary words. 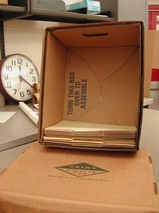 Box – Container for folders. Processing began with replacing several of the first set of boxes that had ripped tops or torn corners/edges. Simply put, contents from old boxes are moved to new boxes. Propping the box allows for folders to be neatly and orderly stacked on top of each other while transferring contents from one box to another. 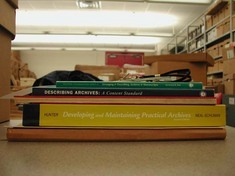 Another tool, a sponge, acts as a placeholder, keeping folders upright and ensuring they don’t collapse or fold over as other folders are removed. Folders that are ripped, weak, or colored are replaced so that the folder will reinforce or adequately hold the contents within. 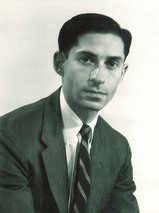 Pencil – Each folder is labeled with the collection number, folder title, and the date. Whether you like an old school #2 or a high-tech mechanical, it’s the processors choice – just never use a pen. Eraser – We’re not perfect! Stapler, staples – Labeled folders that do not need replacing are stapled on the label. Due to the humidity levels of the environment in which the collection is stored, the adhesive on the labels will give way over time resulting in a label free fall. 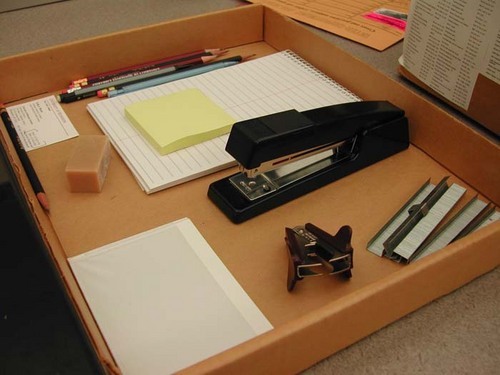 Staple remover – During the creation of the record (based on the administrative flair of the creator) notes, business cards, and other miscellaneous items were often stapled to the inside of folders. The staples are removed and the newly-free, formerly-attached items join the remaining folder contents. Post-It Notes – To make notes! 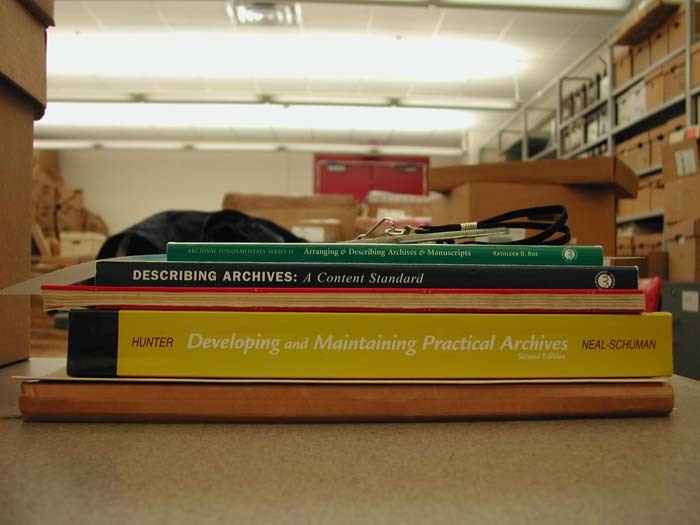 Reference materials – In addition to the University Archives processing guidelines document, our project adviser has shared with us several standard references for archival processing. Computer – The collection series, folder title, and date is recorded on a spreadsheet to make a record of the contents of the collection, which will later be converted to encoded archival description (EAD) which will be used to create a finding aid. But before we get ahead of ourselves with talk of finding aids (we have completed processing just short of 30 boxes thus far), there is one final and and important material that is of paramount use in the archives – cotton, wool, polyester, whatever variety of fabric blend preferred by the processor that will provide an extra layer of warmth in the cool, cavernous, temperature controlled environment. 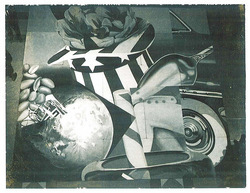 The concepts of museums, the methods of teaching art, and the attitudes of art have changed completely since WWI. 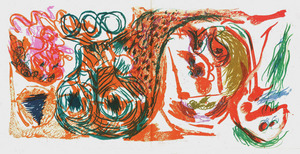 Our 19th century patterns were deliberate and unhurried; speed is today’s yardstick. Therefore, what is presented must meet the demands of rapid appraisal, coupled with maximum interest. 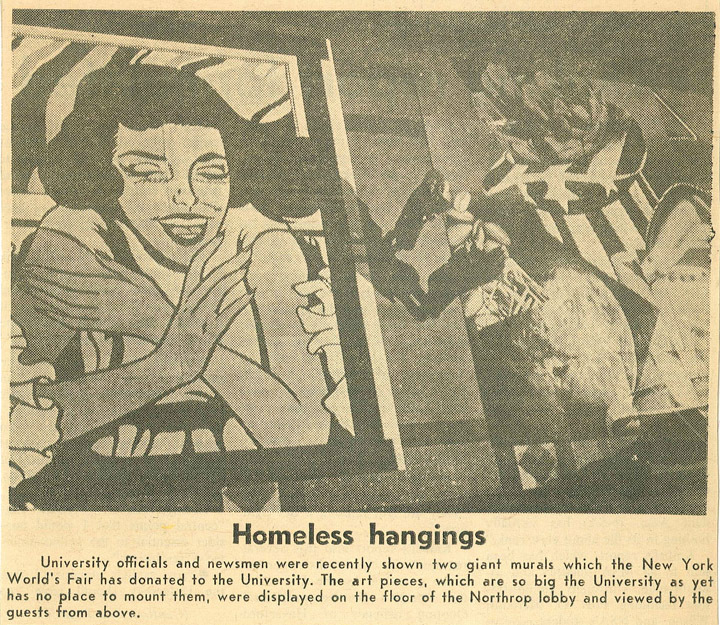 The University Gallery, on a very modest budget, hopes to be able to initiate a new program which will aim at bringing to the campus a series of small exhibitions of work by New York artists of interest. 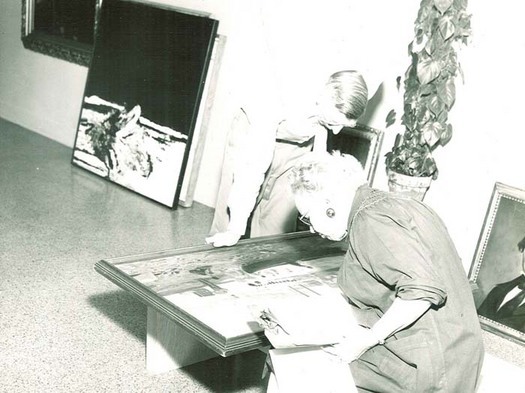 Amongst the files that were kept on exhibitions held at the University Gallery, an occasional treat is provided to the processor by the inclusion of photographs of the installation and final appearance of the exhibit. 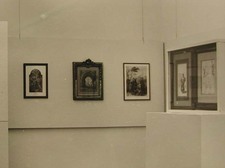 Often intermixed with correspondence and checklists of artwork, these photographs offer us prime examples of exhibit design from the era in which the exhibition was held. 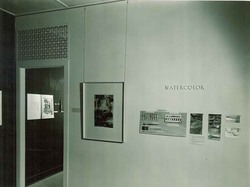 “Materials and Tools of Art,” prepared by Gallery staff, was held from September 29 to October 29, 1947.